Hehe...how was my title? Cool right? It's not JLO's song. It's MY song. Off the Floor! One thing that I had been trying to locate within Singapore, was a good grip for my brooms, dust pan and mop. 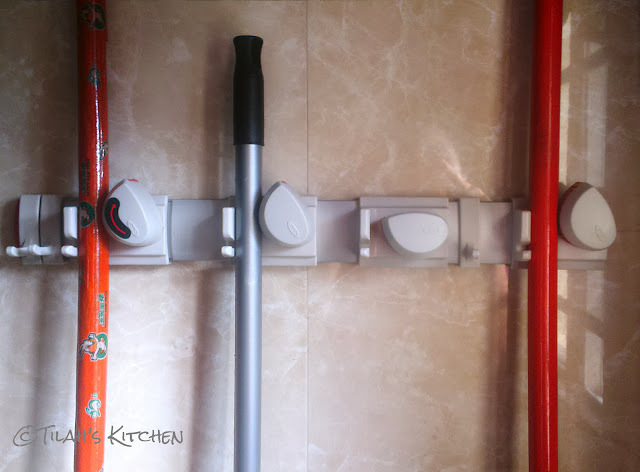 When I renovated my kitchen, I did not cater a storage for my brooms and floor mop as what I had in mind was to fix a nice looking grip on the wall just outside the toilet in my kitchen﻿ to hold them. I know that my store room will be quite occupied and I had to keep it locked so that Sayf, the other man in my life will have limited adventurous quests! It would then be quite inconvenient to keep unlocking and locking the store room door to get brooms and floor mop! Shockingly, I couldn't find one. Dear hubby and I went to DIY shops and hardware shops around the East only to be disappointed as we could not locate something like the one I had in mind. I ended up settling for some grips with stickers which actually said "permanent" hold. We bought about 4 of them. Of course, I was quite happy then. We went home and got it fixed or should I say "pasted" on the wall. The instructions said to let the stickers stand for one night so that the glue would stick and hold "permanently". 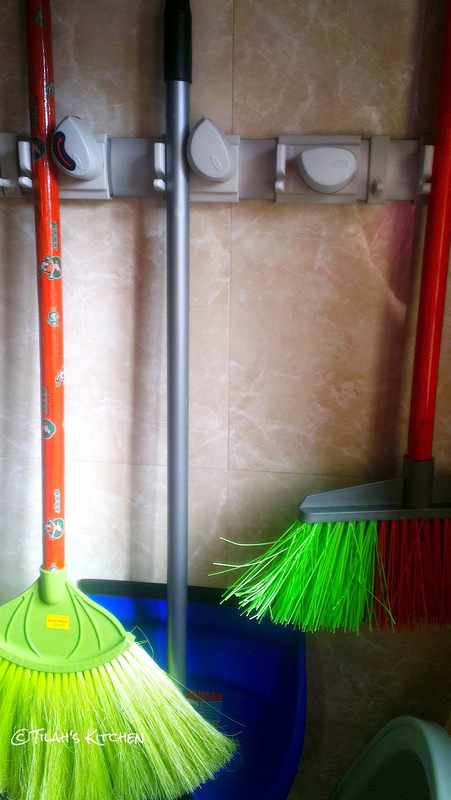 When the next morning came, I happily placed my brooms, dustpan and floor mop for grips! A few days went by happily for me until one morning. I saw one of my brooms on the floor with the sticker. I re-pasted the sticker and left it on for a day before I re-gripped my broom and after a few days, my floor mop fell on the floor. Thereafter they took turns to fall on the floor before they all decided to finally go down together. I gave up and found a corner beside the washing machine in the kitchen to sort of store my brooms and foldable dustpan. The next thing I knew I had a very willing three and a half year old child slave who goes around sweeping papers which he had torn up around the house! I am sure you all would know how clumsy a child like him would get holding a broom and dustpan taller than himself and moving around the house! I felt like pulling my hair every day! Sayf had found his new toys! That was when I started hunting for grips online. 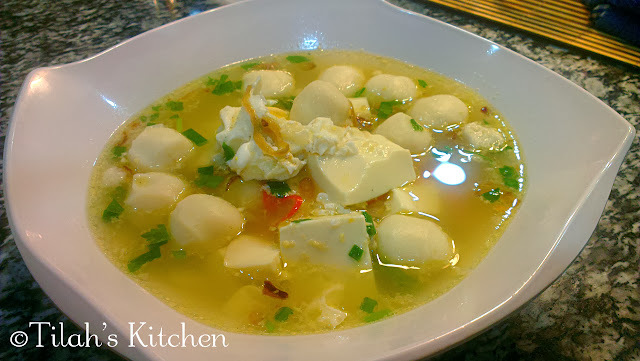 I always like to shop online for things that I cannot find in Singapore. Amongst these were DVDs of my favourite tv series or movies, my plus size maternity dresses when I was pregnant and some herbal supplements and the only one place I go to find good quality everything, is Amazon. 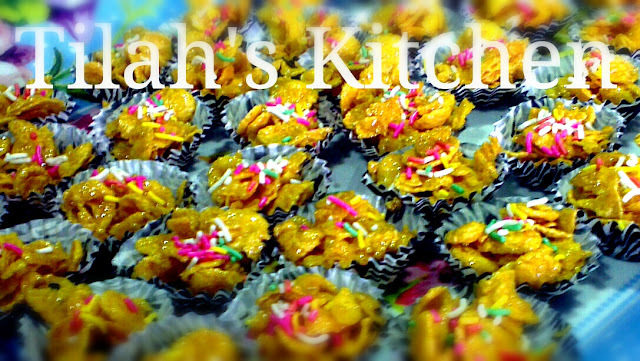 For everything kitchen-ing or not! So naturally, as a last resort, I had searched for some wonderful grips on Amazon. Boy was I glad that I finally found the one that I like. OXO Good Grips! 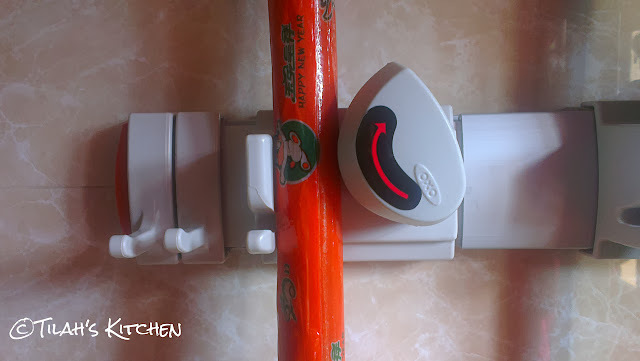 Yes, I had to spend a little bit more as I had to pay in US Dollars and I had to pay for shipping charges, but I got what I really needed for a happy kitchen-ing life for at least a good few years if not forever! My grips to grip my precious things! 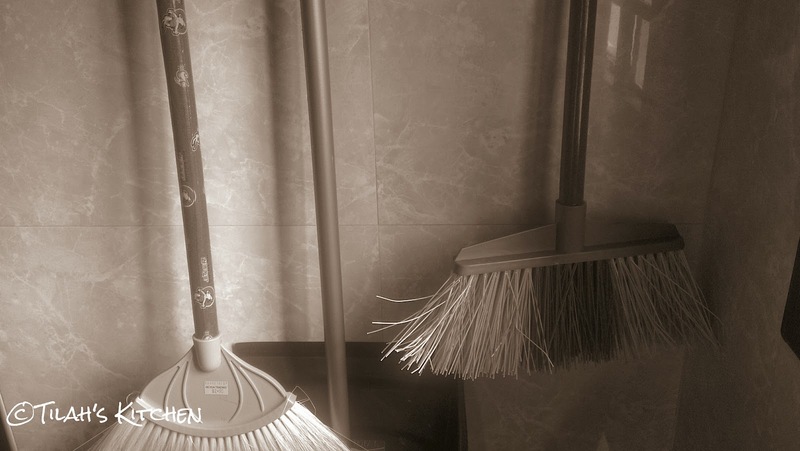 My brooms and dust pan! And floor mop! Gripped! Don't ask me about installation though, as all I had to do was make a simple request to my HERO! My dearest husband! MEN! DON'T STAY HOME WITHOUT THEM!" Hehe...actually he knows that it is supposed to be a job for his skilled hands even without me requesting...hehe ;p which made installation process a breeze but honestly, all my husband did was to stare at the assembling instructions, play around with it for a while and then drill some holes into the wall and Ta Da! My great grips after installation! This would also be perfect, in your store room or at your backyard! All you need to do is to simply lift up that grip in the direction of the arrow to grip and un-grip! Sayf can't reach the grip! Yaay!! Oh yes! Noticed the hooks? You can hang dusting towels and anything else you want on it! Beautiful and organised finally! Within my reach any time! It's Sayf''s turn to start pulling his hair now...haha! For some of you out there, don't fret! I have set up a small shop on my blog selling everything Kitchen-ing, as well some other stuff from Amazon (which I think all kitchen-ers would love)! 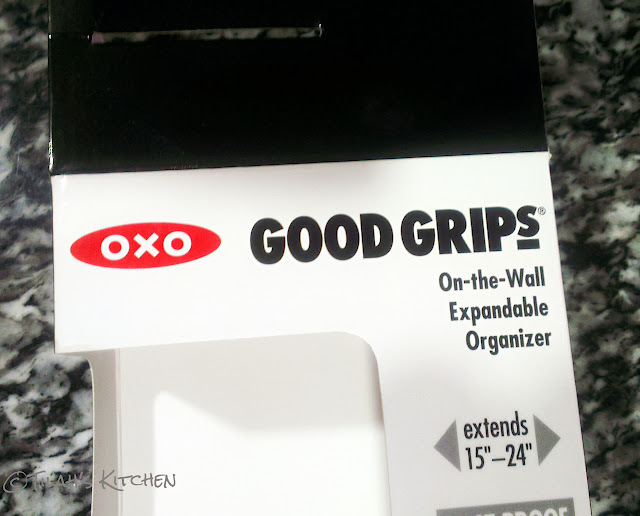 Do check out Tilah's Kitchen Shop and search for "OXO Good Grips" or any other stuff that you might want or need.